The experiment consists of two free-falling units (FFUs) which are to be ejected from a REXUS sounding rocket. One of the FFUs will then begin emitting IR light, while the other FFU, equipped with a IR sensor, will measure the intensity in several bands. Using these measurements, the concentration of CO2 can be determined. The main difficulty of the experiment is to keep the IR sensor oriented towards the source. The developement, manufacturing and demonstration of a system mastering this attitude control problem is the main objective of the project. 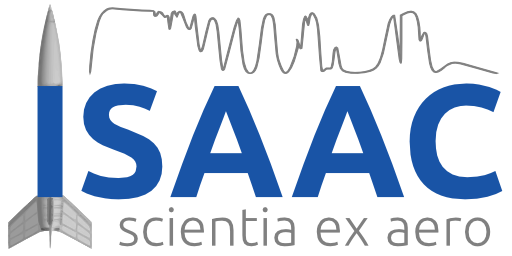 The ISAAC project is a part of the REXUS/BEXUS programme, run by the European Space Agency ESA, the Swedish National Space Board (SNSB) and the German Aerospace Center (DLR). EuroLaunch, a cooperation between the Esrange Space Center of the Swedish Space Corporation (SSC) and the Mobile Rocket Base (MORABA) of DLR, is in charge of the campaign management and operations of the launch vehicles. Experts from ESA, SSC and DLR provide technical support to the student teams throughout the project.The experiment will be launched on a sounding rocket from ESRANGE near Kiruna, Sweden in March 2014.